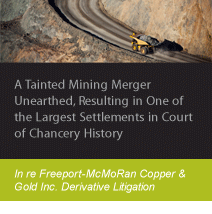 On April 7, 2015, the court approved a combined $153.75 million settlement with Freeport-McMoRan Copper & Gold Inc. (Freeport) and Credit Suisse, making it the second largest settlement in the Delaware Court of Chancery history. Labaton Sucharow, on behalf of co-lead plaintiff State-Boston Retirement System, initially secured a $137.5 million cash settlement in January 2015 with the Freeport's board of directors and contained an unprecedented provision, allowing direct payment to stockholders by means of a special dividend. The settlement also contained certain corporate governance reforms to be implemented and maintained by Freeport for at least three years. For more information, please read the settlement press release. Subsequently, the co-lead plaintiffs resolved potential claims against Credit Suisse, financial advisor to the Freeport special committee, for an additional $16.26 million. This derivative action arose from Freeport's acquisitions of Plains Exploration & Production Co. and McMoRan Exploration Co. in early 2013, totaling approximately $20 billion. Freeport stockholders alleged the transactions were tainted due to the overlapping boards and ownership of the three companies involved. Co-lead plaintiffs claimed that the board of Freeport approved the transactions in pursuit of its own interests and in breach of its fiduciary duty to stockholders. The case is In re Freeport-McMoRan Copper & Gold Inc. Derivative Litigation, No. 8145-VCN (Del. Ch.). The lead plaintiffs are State-Boston Retirement System; Dauphin County Employee Retirement Fund; Amalgamated Bank as Trustee for the LongView LargeCap 500 Index Fund, LongView LargeCap 500 Index VEBA Fund, LongView Quantitative LargeCap Fund, and LongView Quantitative LargeCap VEBA Fund; and City of Roseville Employees' Retirement System. Labaton Sucharow represents State-Boston Retirement System. The defendant is the board of directors of Freeport-McMoRan Copper & Gold Inc.